As a co-founder of WorkingAbroad, I am fortunate to be able to visit the projects we run abroad and this summer, I went with my family and we participated in the Dolphin Research Project in Greece as volunteers for one week. The first thing we experienced upon arrival in Greece was the warm welcoming southern wind that caressed our faces whilst taking our first steps down the stairs of the aircraft. It was a moment similar to sinking into a bath after a long working day. Within minutes we had removed any wool left over from the UK and reached for our flip flops - and those flip flops would stay on our feet for the rest of the week. Once through customs, we were greeted by Ioannis and Beatrice, two young and bright-eyed biologists who were there to lead and work with us during our stay. The journey from the airport to Vonitsa, where the volunteer house is based, is only a short drive through meandering roads flanked by a the sun-baked landscape of cypress, juniper and ancient olive trees. 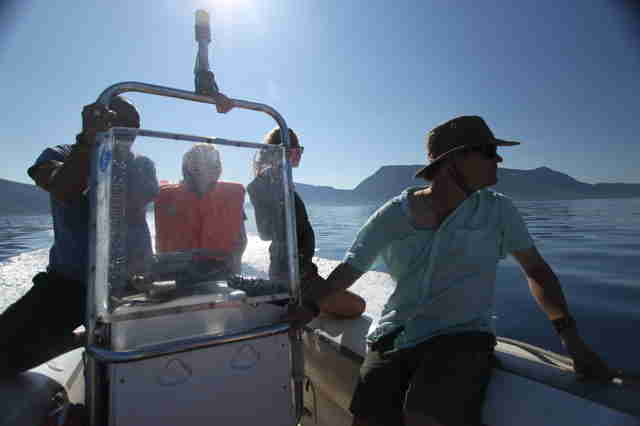 Ioannis, the Principal Investigator of the program, was verbose and enthusiastic from the start and after five minutes into the journey, he had already captivated us by the world of cetacean science and dolphin observation. The stories he told us in the car inspired us and made us all eager to get on the research boat. Arriving at the small town of Vonitsa gives you the feeling of coming to an older Greece, there are no hordes of tourists here, except for a few sailors who dock their boats for free in the local marina. The town consists of local people who live and work throughout the year. Which gives you a more homely introduction to Greece than to the seasonally transient and faceless holiday resorts. Even if the town is provincial and small, it has all the conveniences you need, pharmacies, supermarkets and so on, and in a typical Greek style, they have plenty of tavernas (restaurants), where you can sit and eat grilled sardines and watch the fishermen go out under the light of the moon with their great-grandfathers' wooden fishing boats. The light from the fishing boats at night form a necklace of glaring pearls on the water. A sight which must have been witnessed for centuries. The volunteer house is divided into two parts, one apartment where the biologists live and where the kitchen is, and one spacious and large room where the volunteers live and where the research data is inputted. The volunteer room has plenty of areas to throw a cat around, and as we were a family travelling, they had provided this whole room for ourselves - which was a needed luxury. The next day we had an early morning rise. With our dry bags, videos, cameras and monopods over our shoulders, we walked to the marina where the boat was moored and headed out to the middle of the Ambracian Gulf, to get to meet the bottlenose dolphins. The water was calm, which meant good visibility, and on the spur of the moment, dorsal fins protruded from the water a hundred meters (approx. 328 feet) from the boat. I looked at my daughters Chloe and Rosie (11 and 8 years of age) and it was a joy to see the expression in their faces. One thing is clear: nature still provides the most fascination in children, no matter how many iPads, Laptops, and social media our society cram into their daily lives; it also occurred to me how important it was for them to feel and experience this thrilling sensation. Catching sight of a dorsal fin whilst sitting on a boat presents you with an instant sense of awe, and a sense of possibility and mystery. Also our biologists, who see this everyday, don't tire of it, as their excitement too was visible on their facial expressions. The dorsal fins disappeared under the water and were gone, we thought we had lost the dolphins, but we couldn't have been more wrong as they were just as curious about us and in the next instance the dolphins were bow riding under our boat, tilting their heads up to give us a good look from beneath the waves. We were all beguiled by their presence, intelligence and awareness. We were told that dolphins see their world in different ways, their vision is limited as under the sea visibility is restricted. But instead they send out clicks from their jaws which creates a sound wave, and this sound wave bounces back to them to reveal a three dimensional picture in their brain. The sound waves disclose not only the exterior of the object they are observing but also the interior of the object - it's like an ultra sound - if they were looking at a human being they would see, through the sound waves, the kidneys, lungs, and our entire skeleton structure. Scientists have discovered this phenomena by hiding fish in concealed boxes, dolphins would know that the fish was inside through their ultra-sound capabilities. Another fascinating fact is that the brain of the bottlenose dolphin is more complex and larger than a human brain. In addition, each dolphin has a signature whistle when they call out to each other, which means that there is an entire language which we have yet to understand and study. Needless to say, the science of cetaceans is spectacular and intriguing. We spent the next few days on the boat encircled by the dolphins and taking pictures of their dorsal fins from the boat. Each picture would be downloaded on a computer and studied in the afternoons with Beatrice. 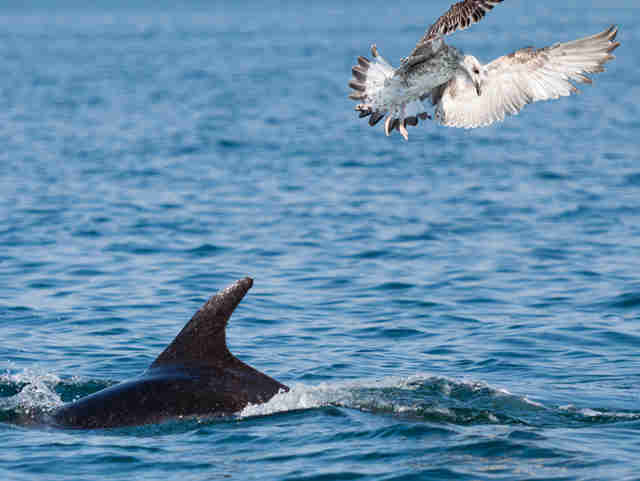 The work of identifying dorsal fins forms part of a larger study which will succour to conserve and protect the bottlenose dolphins in the Gulf of Ambracia. The days we spent on the Gulf were full of dolphin activity: we saw them everyday, playing, feeding and bow riding. Being part of their activities for a brief period in the wild was a wonderful evocation of the life of a dolphin, and it was a privilege to be part of this important conservation work. Our girls also had to help with the research which gave them a lot of satisfaction and sense of responsibility. On our last three days we had the benefit of studying with Joan Gonzalvo, the Project Director, who had returned from a cetacean conference in Madrid. We transported the boat from the Ambracian Gulf to the Inner Ioanian Sea, to search for the more elusive short-beaked common dolphins. Their name, with the reference to "common" may cause a misunderstanding for the reason that they are rare and endangered in the Mediterranean. The Inner Ionian Sea has clearer water than the Gulf and if you are lucky, you can capture the dolphins underwater with a water-proof camera. Before we knew it, someone shouted "fin, twelve o'clock, a hundred meters!" There was not only one dolphin, but over twenty short-beaked common dolphins, all around our boat, playing, feeding and jumping out of the water. This was a natural spectacle none of us will forget. That day we managed to capture a group of dolphins swimming under water by putting a GoPro on a monopod stick. Our encounter with the dolphins and the experience of seeing them wild in their home habitat will stay with us for life. The dolphin research project in Greece allows you to connect with the magic of the sea and the wild dolphins that still live alongside us in our crowded and industrial world and most importantly the project allowed us to engage with the dolphins positively, it is on the dolphins terms: no swimming or touching the dolphins is allowed, which is an important sense of respect to be adhered to. 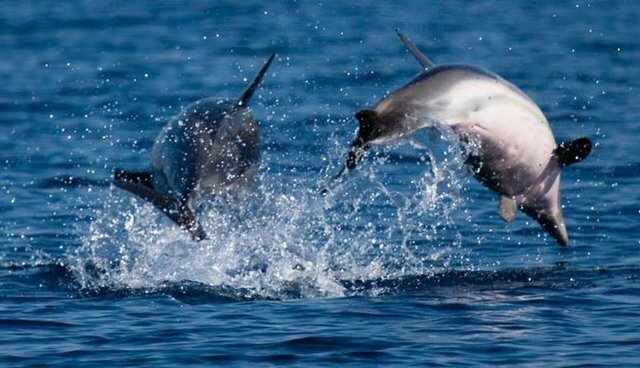 As a volunteering family this project comes warm-heartedly recommended, but also, if you are a student in marine biology, or simply someone who is interested in dolphins, and wants to spend a week in Greece, this program fulfills all you can hope for. For more information on this program visit WorkingAbroad.